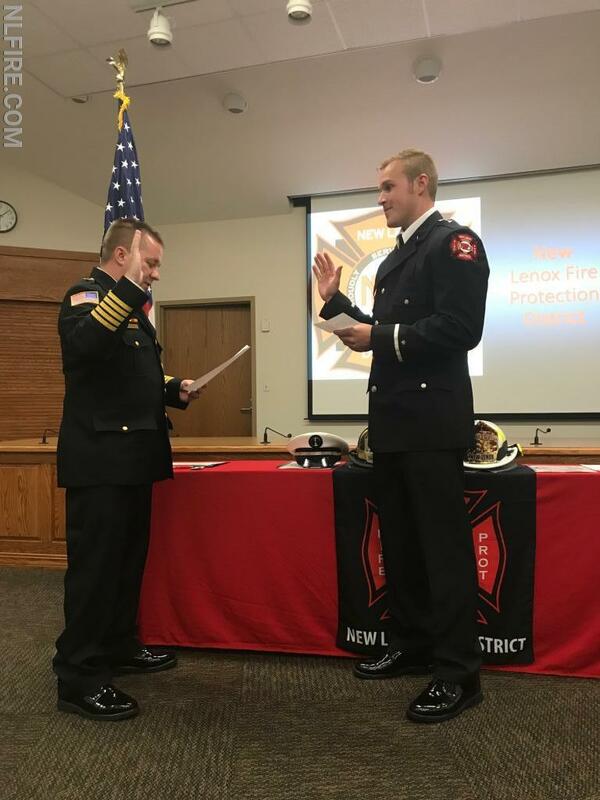 On September 17th, New Lenox Fire Protection District (NLFPD) held a swearing in ceremony during their Board of Trustees meeting to promote a Lieutenant and a Battalion Chief. The new Battalion Chief is Michael Parkhurst; he has been in the fire service for 17 years, eight of those with the NLFPD. Currently, he also serves the district as the Training Officer, Pre-Plans Coordinator, Equipment Testing Coordinator, Fire/Arson Investigator, Black CART Team member, and Southwest Hazardous Materials Response Team Technician. Battalion Chief Parkhurst will oversee all day-to-day operations for the district’s four fire stations on Gold Shift. The new Lieutenant is Zach Cook. 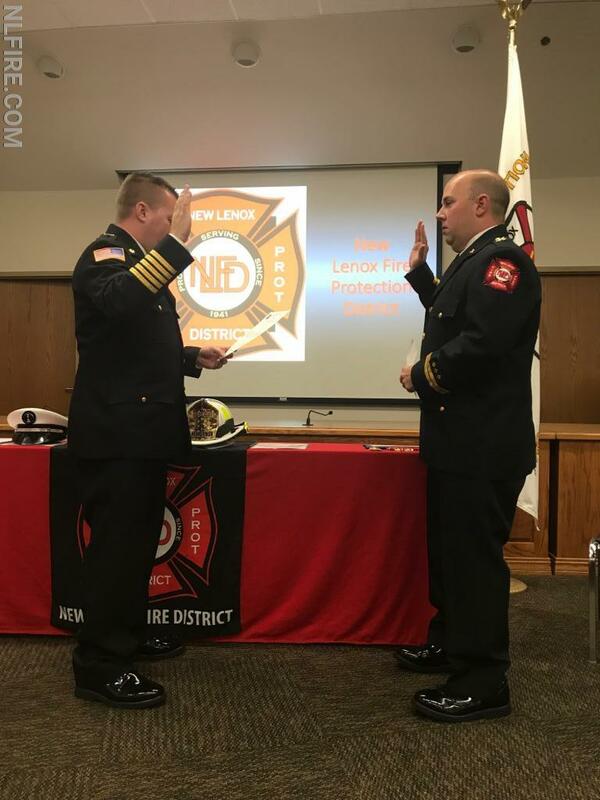 He has been in the fire service for 8 years, over half of those he has spent with the New Lenox Fire Protection District. He has been an active member with the district and served as co-chair for the MDA Fill the Boot Drive. He most recently was the Engineer for Truck 61 on Red Shift. Lieutenant Cook will remain on Red Shift and will be in charge of the firefighter/paramedics at Station 3. 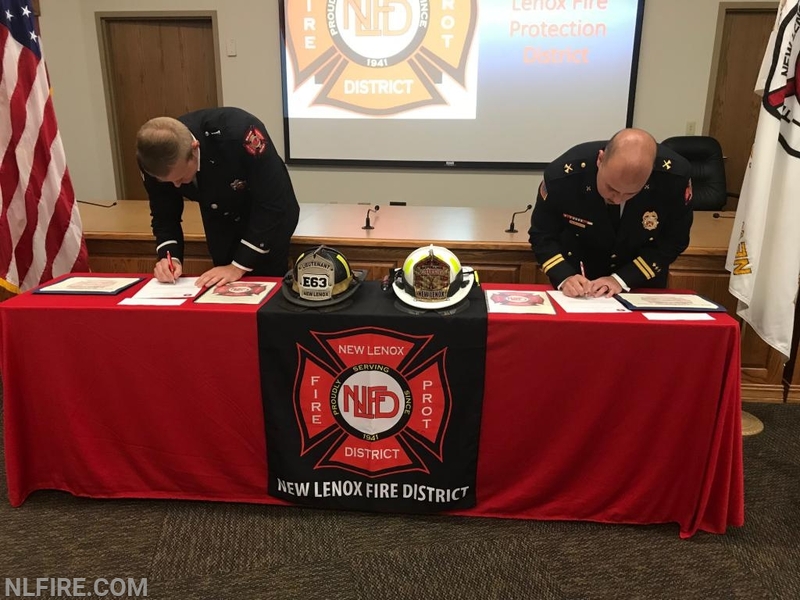 The Battalion Chief and Lieutenant had to go through an assessment center conducted by the Illinois Fire Chiefs Association and a written test to be then placed on an eligibility list. Each list is good for three years, and then the process is gone through again. When positions are vacated, the district promotes candidates from these lists.